Presenting these high-end devices called for premium materials and informative visual communication. Thick shelf profiles created a formidable look and the branded shelf front graphics were recessed into the edge. Backlit dimensional lettering for the logo, magnetic graphic panels for easy updates, eye level angled shelf to glorify new products and LCD screen for media content showed the brand and at its best. B&H Photo & Video and K&M Camera are two of NYC’s iconic specialty retailers for professional AV equipment where the worlds’ top brands show off their merchandising muscle. Glyph Technologies makes products for creative professionals and needed two sleek and brand consistent fixtures to stand out from the competition and customized to each retailer’s specific merchandising parameters. The presentation of these high-end devices called for premium materials and visual communication. Thick shelf profiles created a formidable look with a recessed area in the front edge so the branded graphics strips were flush to the surface. Backlit dimensional lettering for the logo, magnetic graphic panels for a clean look and easy updates, an angled shelf at eye level to glorify the new product drives and the LCD screen for educational multimedia content showed the brand and it’s a product at its best. 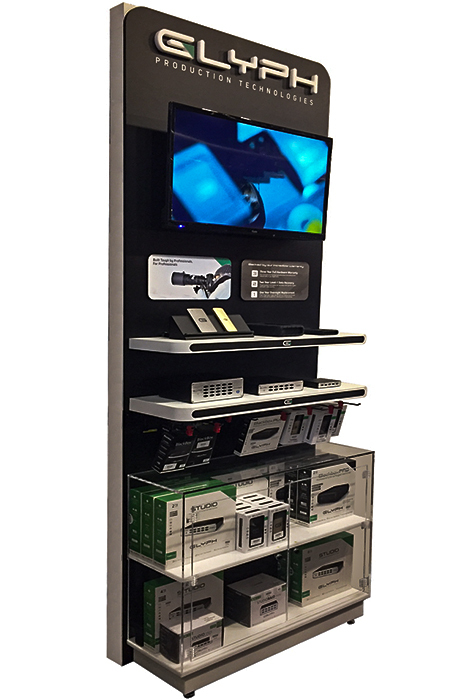 Addressing the security needs with a clear locked cabinet for K&M and a neatly sectioned shelf for cards to order out of stock product at B&H delivered all the information these professional users wanted while satisfying both retailers’ space and protocol requirements. We made a great decision when we decided to work with the Tri-Plex team. Jason and his team at OSI are all-stars! His creativity and and attention to detail have helped elevate our retail presence at some of our most important locations. He is very budget conscious, and has a way of translating our simple words into exactly what we’re looking for. Would recommend without hesitation!